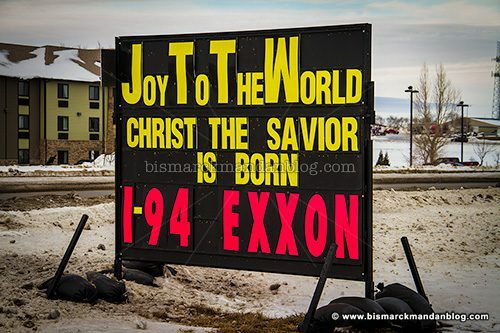 It’s been a while since I’ve posted…well, anything, but especially about a local business standing up for Christianity. 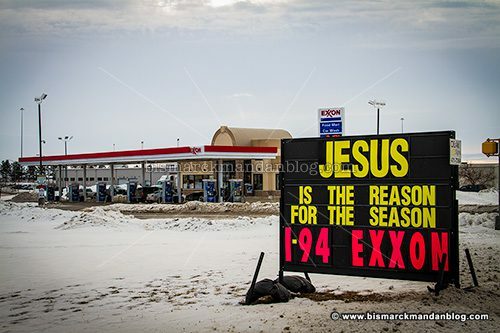 Well, here’s a reason to top off your tank or get your morning coffee at I-94 Exxon, the one on the north side of the Centennial overpass along I-94. In case you’re a firebreathing fundamentalist and the first sign was a little too milquetoast for you, here’s the other side. Right on. 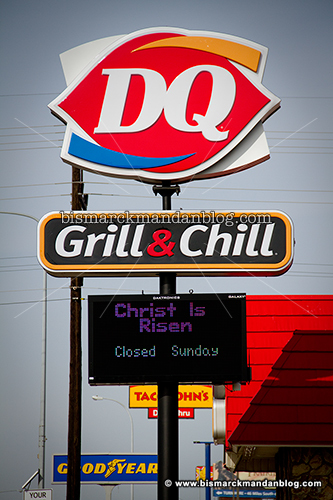 The last I recall is Dairy Queen in Mandan declaring “Christ is Risen” on Easter weekend. Awesome. Clearly these businesses understand their customers, not nationally driven agendas funded by minute groups of activists. With so many national businesses trying to eschew the Christian faith while championing those who wish to attack it, I’m thankful to see local businesses who aren’t so out-of-touch and are willing to make a declaration for their customers. Thank you, I-94 Exxon and Dvorak Motors, for adding your voices to the Christmas season. PS: Try the White Chocolate Caramel cappuccino. Just sayin’. This entry was posted in Around Bismarck-Mandan, Faith, Signs, Logos, Typos by Clint. Bookmark the permalink. This is another thing that makes me so proud to say I am employed there. So nice to see! !